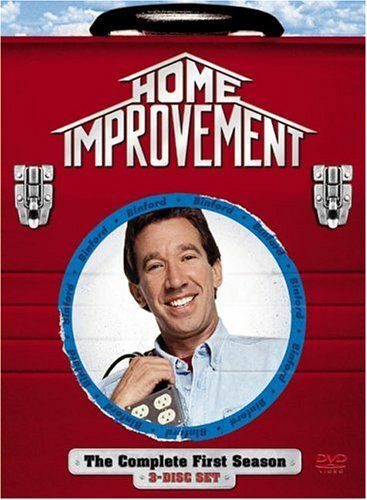 Home Improvement is a family sitcom about Tim "The Tool man" Taylor (Tim Allen), the host of a local cable home improvement show called "Tool Time." Home Improvement looks at Tim at work, and at home, as the husband of Jill (Patricia Richardson) and the father to three teenage boys. Having been married for almost 20 years, Tim and Jill have had their share of fights, but with the help of their wise, mysterious neighbor Wilson W. Wilson, Jr. (Earl Hindman), things often turn out all right. Earl Hindman Wilson Wilson / Jr.
After breaking one of Tim's tools that has been in the family for twenty years, Mark fears that he will be traded in after Brad and Randy make up a story about ""Peter"", their former brother that was traded in after he broke one of Tim's flashlights. When she can't find a babysitter, Jill has a magician watch the kids while she and Tim go on their romantic dinner. However, Tim is too distracted by a football game to pay attention to her. Meanwhile, the kids accidentally lock the magician in a trunk. Tim becomes green with envy while putting up a new satellite dish on the roof when Jill's teacher visits. After Jill drove while her oil light was on, Tim shares this with the Tool Time audience and the other guys say their wives don't respect their tools. Tim decides to put in another sink in the bathroom so his shaving junk won't be in Jill's way, but the project takes longer than he expects. Tim and Jill have a bowling match against eachother and try no to make it competitive, until the K&B Construction guys show up. The boys get in trouble at an arcade. Jill doesn't want Stu Cutler, Tim's old college friend, in the house. So Tim tries to keep him away but when he gives in and Stu comes to the house, he insults Tim and Jill and belches with the boys. Karen visits and Tim must stand up to her. Jennifer invites Brad to her parents' anniversary, so Jill teaches him how to dance. Tim gets Jill a lifetime membership to a health care club, until she says she willl never excercise again. Brad and Randy spend all of their money on a baseball card, so they make Mark give them a ""brother tax"" to get Jill a present. Mr. Binford ruins Tim and Jill's romantically planned weekend by making them go camping to present Binford's new line of winter camping gear. Jill tells Tim that he is a bad listener when he doesn't remember her mentioning the opera fundraiser. Brad and Randy try to get Mark to eat a worm while working on a birdhouse. Tim accidentally breaks one of Jill's pottery projects when she leaves it in the garage. Tim lets Al host Tool Time for a day after blaming him for one of his mistakes. Al and Robin, Jill's sister, ruin Tim's poker night.